Automation has completely transformed the workplace. As technology advances, jobs that would normally have been completed by humans are becoming obsolete. Whilst we have become accustomed to this happening with manual based work such as factory operations or farming, this is changing. Automation is no longer confined to manual labour, it’s now making its way in to office environments and many people are concerned that the next profession to take a hit will be sales. One of the main reasons why sales is under threat from automation is due to the fact that many tasks that would have traditionally been carried out by people are now completed by technology. Software has become so sophisticated that it can now take on many aspects of marketing and sales. To compound the issue, computers can carry out these tasks faster, more efficiently and with less errors. 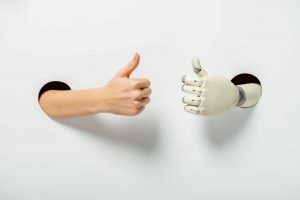 Therefore, just like with every other example of the automation in the workplace- it’s completely understandable why business owners would make the change, it improves operations and it’s cheaper. So what aspect of sales is actually moving towards automation? Typically, it’s the processes leading up to the sale which are most likely to become automated. In fact, research has shown that 70% of the buying process is completed before a customer has even spoken to a real person. This is a really important statistic as it shows that the majority of sales is happening without human interaction. The aspects of sales that this represents is processes such as contacting prospective customers, lead generation, lead enrichment, marketing etc. Before we completely right off a career in sales, it’s important to point out that there is still a place for human workers within this sector. Computers and software programmes excel in many areas but they will never be able to compensate for a real human interaction. The business world is clearly becoming much faster, intelligent and data-driven but we are losing the human touch. It‘s very easy for a company to have an over reliance on technology and risk appearing cold, aloof and money hungry. This is why sales isn’t currently and probably never will be completely automated. This doesn’t mean that those who work in the industry are off the hook. The only way to get ahead of the curve and stop your job from being delegated to a machine is to embrace automation. Many of the processes that are becoming automated are tasks such as sending large volumes of emails, call logging, dialing numbers, scheduling appointments and matching leads with reps. These are all time consuming and monotonous tasks which is why they are being automated. Therefore, sales reps should look at this as a benefit- allowing them to focus on areas in which they excel. For example, actually talking with customers, creating relationships and offering something that machines can’t. Similar to the way in which workers in other industries have adapted to the encroachment of technology, salespeople need to stop fighting it and instead embrace it. Take advantage of the benefits that technology offer but showcase to employers that you offer something that is irreplaceable. This entry was posted in Observations & Answers on February 1, 2019 by Roland.